The kids are back in the kitchen. This week, Food Network announced the new season of Chopped Junior will premiere on July 26th. A spin-off of Chopped, the cooking competition series pits young chefs against each other for a cash prize. Ted Allen hosts. New episodes of Chopped Junior begin on July 26th at 8 p.m. ET/PT. NEW YORK – July 7, 2016 – Chopped Junior premieres new episodes all summer long, with a new season premiering on Tuesday, July 26th at 8pm ET/PT on Food Network. Hosted by Ted Allen, each episode features four junior chefs as they showcase their skills in the Chopped Kitchen, making unforgettable meals from a basket of mystery ingredients over three rounds – appetizer, entrée, and dessert – with a limited amount of time. 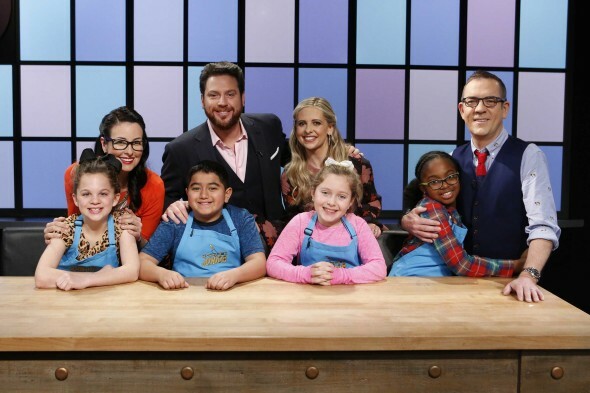 Judged by a rotating panel of both recurring Chopped judges and special guest judges, one-by-one, the junior chef that is not up to par will be eliminated, with the last one remaining crowned Chopped Junior Champion and winning the $10,000 prize. Special guest judges this season include David Arquette; Chris Colfer; Siri Daly; Justine “iJustine” Ezarik; David Alan Grier; Cheryl Hines, star of the upcoming family comedy Nine Lives; Katie Lee; Sandra Lee; Austin Mahone; Angie Martinez; Debbie Matenopoulos, co-host of The Insider; Brandi Milloy; Bridget Moynahan; Chelsea Peretti; Jake Smollett; Alan Thicke; Daphne Oz; Danica Patrick; Michelle Trachtenberg, Laura Vitale; DeMarcus Ware and more. What do you think? Are you a fan of Chopped Junior? Will you watch the new season? More about: Chopped Junior, Chopped Junior: canceled or renewed?, Food Network TV shows: canceled or renewed?